Hyundai Motor’s pioneering ‘A Message to Space’ campaign has won two bronze awards at the international Clio Awards in the Film Technique and Out of Home categories. This latest success completes a triple awards crown for the innovative film following other recent acknowledgement achieved at the Cannes Lions and New York Festivals awards. Soon to reach 70 million views on YouTube, the ‘Message to Space’ video has been the centre of attention on social media around the world since its launch in April. The creative campaign tells the story of how Hyundai Motor sent a message from a 13-year-old girl to her astronaut father. 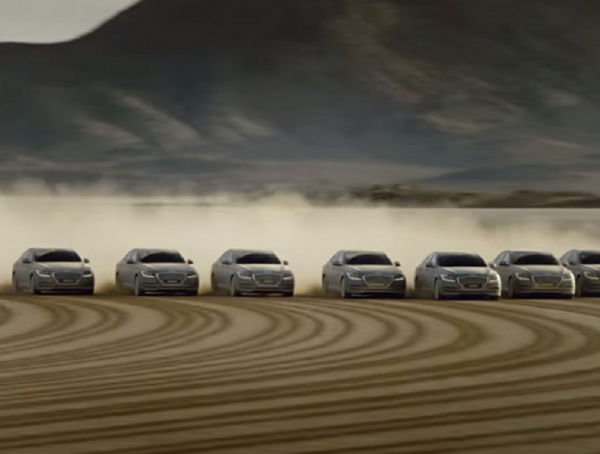 In the video, 11 Genesis cars write a huge message, covering about 5.55 km2, on the Delamar Dry Lake, Nevada – an image the girl’s father was able to capture from the International Space Station. In a unique extension to the concept, Hyundai Motor invited viewers to create their own virtual message to share with loved ones, an opportunity taken up by more than 85,000 people around the world. The Genesis, Hyundai Motor’s premium sedan, which is featured in the film is surprisingly well suited to the terrain of the dry lake in Nevada thanks to its HTRAC all-wheel drive system – available at the push of a button. Customers who drive Genesis appreciate the model’s superior grip in all weather conditions, plus its fun-to-drive performance when the HTRAC system is activated. On top of its internet popularity, the video was aired more than 800 times on US national TV channels such as ABC, Fox TV, and NBC, as well as being covered by numerous high-profile print and online media including TIME, People and Forbes. The Clio Awards recognition follows four bronze honours at the Cannes Lions and New York Festival events – including the Third Prize Award in the ‘Film: Use of Medium’ category at the 2015 New York Festivals World’s Best Advertising awards. The Clio Awards have been rewarding excellence in advertising, design and communication since the first ceremony in 1960. Categories are judged internationally, adding to Hyundai Motor’s worldwide acclaim for its ‘A Message to Space’ video, reaching viewers across the globe, and connecting with those further afield, too – like the astronaut in the story.